Whether they're using it to cuddle with their stuffed animals or make a crash landing, the Jaxx Cocoon Jr. Bean Bag makes a great addition to any kids room. This round bag is made from cushiony foam and a lush microsuede cover that zips off for easy machine-washing, meaning it's a great place to watch cartoons and eat snacks. Available in your choice of color so you can pick the color that fits your child's personality. About Jaxx Focused on both the atmosphere of your home as well as the state of the environment, Jaxx creates functional furniture while trying to maintain a minimal environmental footprint. Since 2006, Jaxx has been working non-stop to create their proprietary blend of up-cycled virgin scrap materials and byproducts now known as ECOFOAM. This alternative to conventional foams and fillers led to a technological innovation that allows for the compression of ECOFOAM to a third of its original size, making it easier and more efficient to ship and store. This has resulted in an even smaller carbon footprint. Today, the Company continues to test the limits of traditional processes to bring you stylish, smart and functional furniture while taking responsibility for the impact on the environment. Jaxx encourages you to follow their lead, be present in your space and live life to the fullest. Round bean bag chair for children. Microsuede cover and furniture-grade polyurethane foam. Available in a wide variety of color options. Removable zippered cover for machine-washing. Dimensions: 48L x 48W x 12H inch. 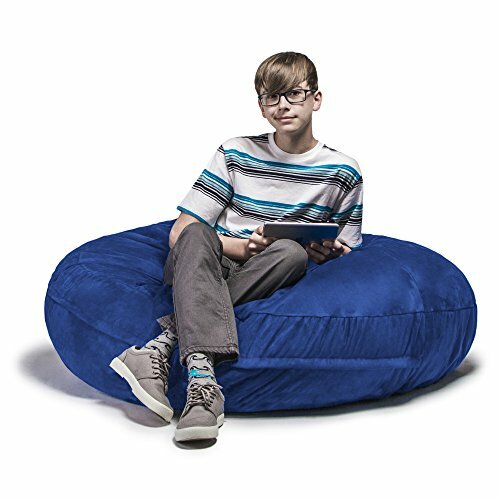 If you have any questions about this product by Jaxx Bean Bags, contact us by completing and submitting the form below. If you are looking for a specif part number, please include it with your message.